Coccidioidomycosis, simply known as Cocci, or Valley Fever, are too small to be detected even by the most advanced bioterrorism equipment. It causes a chaotic mix of symptoms for anyone unfortunate enough to inhale the contaminated dust historically endemic to the American Southwest including California, Nevada, Arizona and New Mexico; Northern Mexico; Central America; and parts of South America. The Center for Disease Control (CDC) estimates that about 150,000 people are infected yearly in the United States alone. About 60 percent of its victims show no symptoms whatsoever. Those that do show symptoms experience fever, cough, headaches, fatigue, muscle aches, and joint pain often misdiagnosed as the common flu, bacterial pneumonia, and even cancer. The process of identifying and recognizing Valley Fever was a long process and continues to be the subject of many cases of misdiagnosis by the medical profession, this situation becomes more evident as Valley Fever spreads into new areas. In 2010 and 2011 the Coccidioidomycosis spores made a large geographic jump north into south-central Washington; the state Department of Health received reports of three unrelated cases of Valley Fever in residents of Walla Walla, Benton, and Franklin counties. These people hadn’t recently traveled out of state. An investigation conducted by local and state health officials determined that these patients were most likely exposed in south-central Washington. The Department of Health and Benton-Franklin Health District collected and preserved soil samples from the suspected exposure locations in Benton County. But it wasn’t until May 2014 that state Health officials urged health care providers to watch for the rare illness, stating that “The fungus that causes “Valley Fever” (coccidioidomycosis) has for the first time been detected in soil samples in Washington, much further north than its expected range”. The Centers for Disease Control and Prevention (CDC) along with colleagues at Translational Genomics Research Institute in Flagstaff, Arizona, recently developed the first method to test soil samples for the fungus. Test results in Washington showed that the soil samples were positive for the Valley Fever fungus, and that these cultures genetically matched samples of the fungus obtained from one of the patients. This confirmed that the patients were exposed in Washington. These findings were important because the Valley Fever fungus had never before been found in Washington soil. However, DNA analysis suggests that the soil-dwelling fungus, has lurked there and in the deserts of the Southwest United States for hundreds of years, if not longer, which leads many to question where else could the fungus be suddenly activated and what are the key events that causes this to happen? There is still much to learn about the extent of this fungus in the environment in Washington and elsewhere. Coccidioides is probably the most virulent of the fungal pathogens. Highly endemic disease areas tend to be semi-arid rather than completely dry. Desert like areas like the Lower Sonoran Life Zone, and throughout the southwestern USA and California, as well as into Mexico and Central and South America seem to provide the best environments for the pathogen. It is prevalent in areas that receive rainfall of about 10 inches (25cm) /year occurring all in one season. The west side of the San Joaquin Valley in California is the most endemic area, but even within this region the fungus is highly restricted to a few small areas. However, spores may blow around-- for example a windstorm in 1977 in the San Joaquin Valley blew spores outside endemic area, and 379 new cases of coccidioidomycosis were attributed to the dust storm. Travel can also spread disease. The main problem is with population growth in endemic areas. People not previously exposed move to the area and develop the disease. Some have the mild form and acquire immunity; others develop severe disease. The fungus can survive at 20 cm under the soil, but it is absent on the surface during hot dry weather. It is also apparently absent from the soil or aerosol during a wet winter and spring, but grows again in the summer and becomes aerosolized in late summer and fall. Sept-Nov. is a peak endemic period. The favored soils are alkaline, have a high content of carbonized organic materials and a high salt concentration, particularly calcium sulfate and borates. The sterile surface is reinvaded after the rainy season, possibly when capillary action of evaporation reestablishes a favorable salt concentration. Survival of the organism also occurs in rodent burrows. Rodents may become infected also and may be responsible for spreading the organism. Climate change is causing the Centers for Disease Control and Prevention to call Valley Fever the “silent epidemic” as it creeps into new arid climates where the fungus lives. There is as now better testing and diagnosis showing that the infection’s incidence has skyrocketed, reaching 22,500 cases in 2011, up from 2,265 in 1998. But with many cases going unreported, experts believe as many as 150,000 people may be sickened annually. 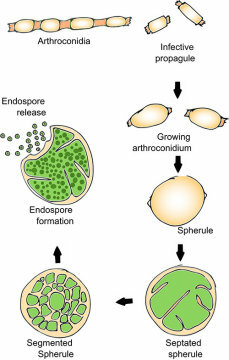 Once inside the lungs, the microscopic fungal spore transforms into a spherule, a podlike structure 10 to 20 times the size of the original spore (30 or 40 microns, or about half the width of a human hair). After four days of incubation, the spherule pops open, releasing about 100 spores, and the process repeats. In three weeks, that one spore has been amplified a million times within the human body. John Galgiani told Linda Marsa of Discover Magazine that, "Even a single spore can cause a lethal infection." Galgiani is the director of the Valley Fever Center for Excellence at the University of Arizona in Tuscon. “While about 65 percent of infections don’t cause any symptoms, the vast majority of those who do get sick develop pneumonia-like symptoms, such as cough, chest pain, shortness of breath, headaches, fatigue and fever. In about 400 cases documented each year in Arizona, spores spread beyond the lungs and can eat away at bones, joints, the liver or spleen, and the nervous system. They can cause meningitis infections in the brain, leading to cognitive impairment, paralysis or death. About 160 patients die from the infection each year,” says Galgiani. Medically known as coccidioidomycosis, or cocci for short, the lung infection is caused by a fungus in the mushroom family that begins life as a tiny, single-celled spore. Even a light breeze can carry the spores aloft, and when inhaled, they can penetrate deep inside the airways of the lungs. Discover reported in 2014, that when doctors examined Shibendra Das in 2013, they thought he had advanced lung cancer. The Phoenix resident had been coughing uncontrollably for weeks. Imaging scans revealed he had a 1.3-centimeter lesion in his right lung and enlarged lymph nodes, suggesting a malignancy had metastasized. “It was very scary,” says the 79-year-old anesthesiologist, who got a second opinion and discovered he had Valley Fever. After being treated with antifungal drugs, Das feels better and has few residual symptoms. But he knows that once the fungal parasites take root inside the body, patients then harbor them for life. “The lesions on my lungs will take a long time to completely heal,” he says. Fungi have a relationship with plants and trees; some vegetation depends on fungi to survive. There are cases where fungi provide the ideal soil conditions for some plant and tree species to propagate and to communicate. As the climate changes entire ecosystems may seek to transition into new areas in an effort to retain the climatic conditions that can optimize survival. Coccidioides may be doing just that. We don’t know much about this fungi’s natural companions. What is it seeking to decompose? What species depends on the fungi for survival – what are its micro and macro relationships? We do know that the Sonoran Desert is becoming dryer and we know that the Columbia River Basin is becoming dryer and more arid. Are we seeing central and eastern Washington transition into a more Lower Sonoran Life Zone – and if this is the case will this zone move even farther north into Canada’s Okanagan Valley? Many people think of deserts as inhospitable places devoid of life, but numerous plants and animals have adapted to this harsh environment, where they often compete for limited resources. In desert environments, the most limited resource is usually water, forcing plants to adopt different strategies to compete with their neighbors for this precious resource. Jennifer Gremer and colleagues are part of a research group at the University of Arizona, they looked at some widespread and abundant plants native to the Sonoran Desert and found with the onset of climate change, the deserts are getting hotter and drier, and have been a focus of global change models. "The Sonoran Desert has already begun to exhibit such changes," explains Gremer. "Specifically, the composition of plant communities has changed over the last 30 years, with species that have high water-use efficiency becoming more common and species with high relative growth rates declining." Drought conditions are delaying nesting by two weeks or more for some Sonoran Desert bird species, such as Black-tailed Gnatcatchers and Verdins. Despite recent rainfall, drought conditions persist in much of the Southwestern US and drought negatively impacts, many wildlife species, making it harder to maintain their numbers, even when adapted to a dry environment. Newly published research from Point Blue Conservation Science (Point Blue) and the U.S. Geological Survey (USGS) finds that increased drought frequency in southwestern North America results in increased instances of delayed nesting. This delay can push the start of nesting back by several weeks in severe drought. This, in turn, makes it harder for many Sonoran Desert bird species to successfully produce young that year, as they are more vulnerable to nest predators and parasites. As climate models are nearly unanimous in their predictions for increased drought frequency in southwestern North America, this finding raises concern for the long term health of desert bird populations. The findings also show that some Sonoran Desert species sometimes forego breeding entirely during extreme drought. "Other studies correlate with our findings, perhaps indicating a more widespread delayed nesting of birds in arid ecosystems," says Point Blue ecologist McCreedy. "These responses are predicted to become more frequent and extreme, due to climate change, causing us to question how desert birds will persist in the long-term." Will birds and plants abandoned areas completely and move to new geographic locations? With human interference like agriculture, urbanization; state and provincial political lines of authority; and international boundaries; ecosystems and species have a difficult time migrating into new areas that may allow them to follow native climatic conditions, some will face extinction others will adapt and perhaps move and then may in the process, force humans to change. 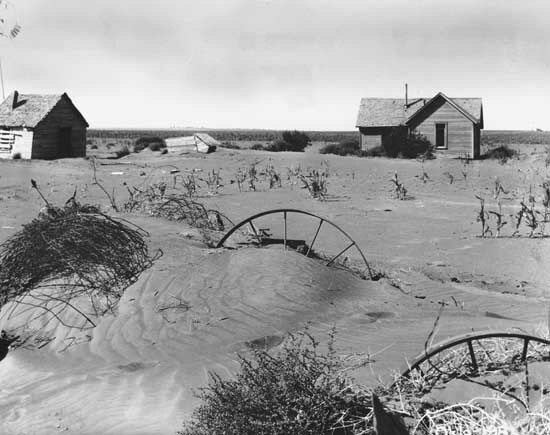 The emergence of Coccidioides and then Valley Fever may be a signal that the soil is fighting back as it seeks to transition a place into a different life zone. We really don’t know the answers to some of these tough questions because we have so much more to learn about our natural world and how it’s changing. The medical profession and public health authorities need to become aware of Valley Fever as it emerges in new geographic areas. According to the mainstream medical profession, Valley Fever has no cure at present and is notoriously tricky to diagnose. One reason is that the disease is readily confused with other community-acquired pneumonias. Currently, diagnosis is carried out through a technique known as immunodiffusion, which tests the blood for antibodies against Coccidioidal antigens. Such tests are considered less than satisfactory, with a false negative rate as high as 50-70 percent. Around 5 percent of symptomatic patients display no measurable antibody levels to Valley Fever by immunodiffusion. Dr. Stephen Albert Johnston, Krupa Navalkar and their colleagues at Arizona State University's Biodesign Institute have been focusing on new research that describes a promising strategy known as immunosignaturing, which can provide clinicians with an accurate identification of Valley Fever. The current study describes an alternate method used to address the poor accuracy of immunodiffusion, applying an innovative new technique known as 'Immunosignaturing'. The technique can produce a detailed profile of system-wide immune activity from a small droplet of blood -- typically, less than a microliter. We don’t know much about this fungi’s natural companions. What is it seeking to decompose? What species depends on the fungi for survival – what are its micro and macro relationships? “Shadow biodiversity” looms large as the climate causes planet Earth and all her species to change course. The term describes all of the unknowns within the web of life, which collectively support our existence. There are many species unknown to us, they lurk in the shadows, and perhaps disappear before we know that they exist – some of them will haunt us.